went to see meet the robinsons in 3-d - it was great! I think that BHK and I were the only adults in the theatre without a kid in tow... I highly recommend catching both it and the chip and dale / donald duck cartoon in 3-d at the beginning. (the Donald Duck was a Stereoscopic movie from the 50's- 3D like the old sterogram style viewmaster reels.) 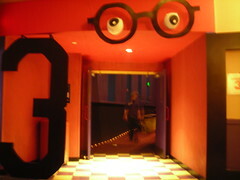 Picture on the right is a cute little entrance folks made for the movie - 3-d glasses and large letters 3 and D on either side of the door. text update - rewind - Another day at work, or another 7 hours, anyhow! Was told by JD that there might be snow flurries this weekend on Saturday? So much for any roto-tilling or lying down of mulch I might’ve had planned. Hm, that sounds pretty darn domestic. Maybe I can get some studying in for my driving permit. I think that my back is in good enough shape to do so. It’s been over a decade since I’ve done any sort of parallel parking or a 3-point turn, but hopefully it’ll come back to me quickly. The crew at my current gig is pretty sweet. Everyone seems to get along quite well, and is personable. JD and RD are brothers (25 and 17, respectively) and are very cool. KP digs the icanhascheezburger type sites like I do, and is worried a bit about the CDC’s Cancun hemorrhagic fever warning. DL is an old-school tech – knows his stuff and is on top of his game. KB is my immediate supervisor, and seems to be an amazingly kindhearted lady… Scouting, family oriented. JM got moved to the DB admin gig I was looking to, but I have no hard feelings about that. He knows his stuff, and has been here for 8 months, so they know him. Some recent rough patches in his life… lost his sister last weekend, has been sick, and lost his mother fairly recently as well. I hope the clouds part for him soon. SP is the Network head here, and she has her old painted character figurine from the D&D days… her kids are embarrassed for her, but I think that’s pretty spiffy. She also has 2 orange cats and a black one, so there’s plenty of critter talk there. KE is the sheriff’s sister in law, and is friendly and cracks the occasional joke here and there. WL is in the CAP, and I may join him at local meetings. GIS staff is also nifty, though I haven’t learned all the names over there yet. There are a few people I wave hello to when I pass them in the hall, but I have no idea who they are form the Dept of Aging and the Substance Abuse folks. A? in the State’s Attorney office looks like Peewee Herman. No, Really. Bake sale by the SO today - I wonder if the goodies will be as tasty as the Methodist stuff from last week. We still have about 1/8 of a pound cake that we got last go ‘round that will be hard to beat. It’s not too shabby to see Officers wearing bunny ears. Update - D’oh! I missed getting anything at the bake sale. It only ran from 8:30 to 11am, and I was in meetings or off site during that time. Fortunately, RD brought in doughnuts, so my pastry craving was sated. What will we do with BHK? No cake for her. Perhaps she’ll settle for me making a tasty din-din supplemented with an ice cream sammich for dessert. BHK and I played the karaoke ps2 American Idol game last night… a lot of fun, more than I’d expected. Apparently, my skills are in the Tom Jones / Kim Karnes / Duran Duran / Everly Brothers arena, while BHK is more of a Billy Joel / Build me up, buttercup sort of singer. I blame my scratchy voice and poorer scores on remaining cough, but that’s just an excuse. BHK is superb at the thing, and I’m just pretty good. We’ll see what practice brings. Perhaps we’ll have a karaoke-off with Tina, Jimmy and Amanda for Easter. On that note, we’re due for some egg-coloring in the next day or three, and egg salad or deviled eggs shortly thereafter. Given that there might be flurries on Saturday (mid-20s to mid 40s Fahrenheit forecast), perhaps I’ll skip the sunrise Service on Sunday at the beach. Bay winds after a possible snow seem a bit too brisk for me. I’m carbo-loading for lunch today. Toasted cheese bagel, some baked ritz-chips and a chocolate pudding snack pack. For the love of the children, why did I skip vegetables? I’ll make a point of getting some apples or grapes for next week. The region I work in is near an area called Plum Point, but there are no plum trees. Pear, apple and cherry abound, not to mention fields of corn, soybean and tobacco (though tobacco is being phased out, even though it’s a big portion of Maryland history, down to the Calvert County flag). Also, there’s an area called Sam Hill… so now I can ask “What in Sam Hill?” with hope of an actual answer. Here’s what new TV is on my PSP – US version of the office, Season one. 5 years ago - Freedom Force, Poem tag, new tech, THE poll. Current Music:Meet the robinsons theme - it's zippy!